Learn how sales professionals can use storytelling to become more effective at generating sales leads. Most people have fond memories of sitting around a campfire with their friends or family, telling stories late into the night. The word “campfire” alone can bring to mind a peaceful outdoor setting, enjoying the warm glow as you relax and listen to the storyteller. Good stories capture our attention – they stop the world around us for a moment in time. In an era when everyone is competing for attention, telling stories your prospects can identify with can greatly improve your sales lead generation. The real power of storytelling is that when consumers can relate to the story, they can’t help but participate. Taking time to understand each prospect allows you to tailor your brand’s story to focus on individual problems and pain points. While B2B buyers must consider the facts when making purchasing decisions, there’s also an emotional element that can’t be ignored. In fact, a study by CEB found that 71% of buyers who see personal value in a product will make a purchase, and personal value has twice the impact of business value in purchasing decisions. 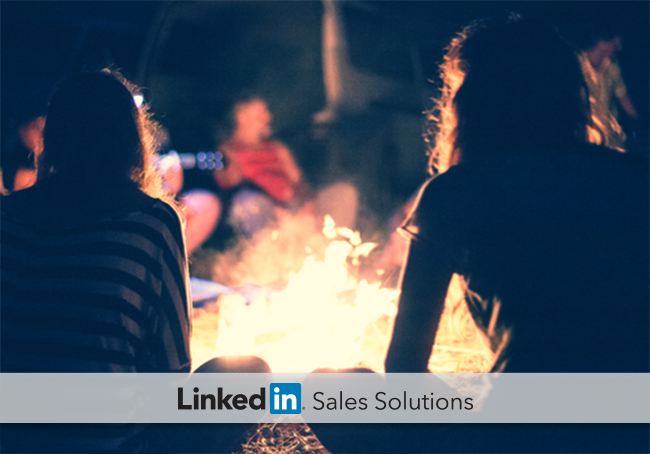 Here are a few ways to gather your sales prospects around the campfire and tell your story. Your brand is the setting for each story you will tell. It’s important to have thorough knowledge of your brand’s history, goals, stakeholders, and overall mission so that you can easily include the specific information each prospect cares about. Industry knowledge is also important. Knowing how your brand fits into the competitive landscape allows you to explain the unique advantages of working with your company, without needing to deliver a “salesy” pitch. Prospect motivations can vary greatly, so it’s important to understand all the things that make your company, product, or service unique, no matter how trivial it may seem. What can you offer that your competitors can’t? How can your product or service help your prospects in a unique way? Being able to effectively communicate this information will make your sales story that much more compelling. Once you have the basics of your story down, next is creating opportunities to deliver your personalized story to the right people. Start by considering the order in which you should reveal information and in what format. One of the easiest ways to tell your story is by sharing content that matches your prospects’ pain points. When sharing content, use personalized messaging to show sales prospects that you’ve taken the time to sync your story with their specific scenario. Contributing to discussions in LinkedIn Groups can demonstrate your ability to answer questions your prospects are asking, and sending a well-crafted InMail is a great way to lead with personalized insights your prospects can’t help but notice. Stories need direction and purpose to be effective, which is why most storytellers determine the end of their story first. While the ideal end of your story is a signed contract, it’s important to ignore personal goals and focus on creating a happy ending for your sales prospects. With the end-goal in mind, you can work backwards to identify which information your prospects need during each stage of the buying cycle. Working backwards can also prevent you from overwhelming your prospect with irrelevant information at the outset of your relationship. Finally, pay attention to how prospects are responding to your messaging. Great storytellers are able to change the tone or focus of their story to align with the audience, and paying attention to subtle cues can indicate the details you should highlight and those you should ignore. The competition for attention is high in the social selling era, and generic messaging is becoming less effective over time. So next time you feel a sales pitch coming on, think back to the campfire and transform your pitch into a story.